I’ve told you the struggle I’ve had with finding ideas for the childcare kiddos to make. It’s so hard when my little group is between 24 months and 15 months old. I have FIVE kiddos in that age range. They are new to crafting and I can’t trust them not to eat supplies or at best only put them in their mouth. It’s a struggle. by the way, that project would work great for Valentine’s Day too…anyway, back to this project. I purchase some Art Canvas Boards and Clear Contact Paper. 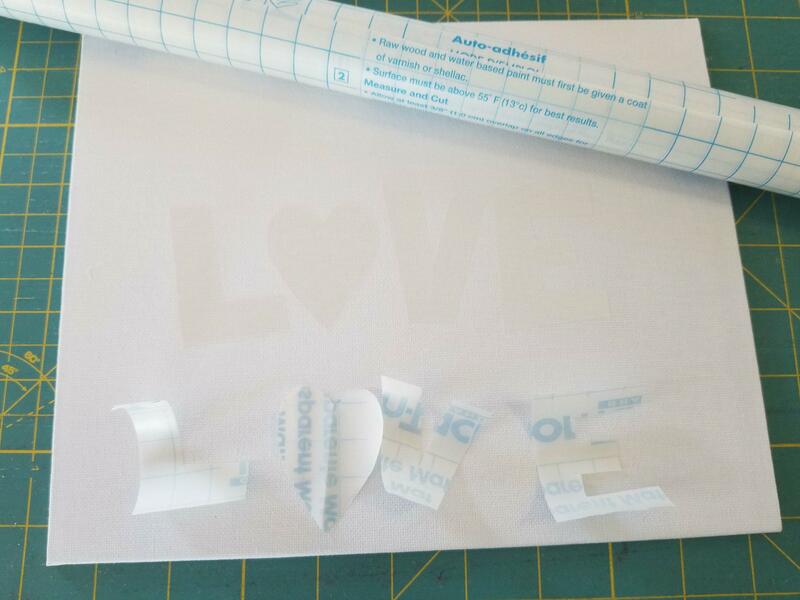 I cut an “L”, “V” and “E” from the contact paper as well as a heart. I pulled the paper off the back of the letters and stuck them in place. I think you can see in the picture that the letters are stuck down. From there I gave the kids paint. I could only let two kids paint at a time as that’s all my patience would allow. I also only gave them two colors at first. I start with the oldest two whenever I do something like this. It forces the younger ones to watch and learn so when it’s their turn they already have in mind what is expected of them. The kids simply paint the canvas. For the most part, they did all of the painting themselves. I had to say “Can you paint right here?” a few times as they had to completely cover the area where the letters were stuck down. Here’s Carver’s turn. He loved it! I set the boards aside while I cleaned up the kids, table and brushes. Then I went back to each board and lifted the clear contact paper off the board. That revealed the letters and the heart. So this is how they ended up looking….. This little girl got a little too aggressive with her painting and the “L” and “E” lifted a little. I haven’t quite decided what to do about that. Each one is a little bit different. I ended up liking them. Part of their appeal is the layered paint…these little munchkins were good at layering on the paint. That’s for sure!! This was an easy simple project. I’ll consider doing it again with a different theme….Maybe the first letter of all of their names. That would be cute to hang it the kids’ bedrooms. Several of you sent me some ideas you do. I loved them and hope to be incorporating some of those ideas with my childcare kids. This entry was posted in childcare on February 6, 2018 by Jo. Another thing is using sponges cut into shapes. Kids like that dipped into paint. You can glue a shape of stiff cardboard to the back then have them dip into paint. We did this with shapes on brown butcher paper for Christmas wrap. I am sure your thinking cap will kick in and find more ways to paint. For correcting the over-aggressive painting, what about White out? Or just leave it. She’s a kid; they don’t have to be perfect. I’m sure their parents will all love the paintings. I would leave the less than perfect one alone. It will still charm the parents, and make it possible for the girl to see how her skills have improved in the future. Such cute ideas. For the one who painted extra hard you can always outline the letters in black. But it doesn’t look bad the way it is. We’ve used painter’s tape and done one big letter for their name! It works great! Please leave the aggressive painter’s art as is! It looks just fine. Who will care? They all look great! P.S. Our daughter was telling us on Saturday that her three year old is just starting to draw circles with dots for eyes and a squiggle for a mouth. They are so cute! She has started leaving out art supplies on the kitchen table, so he can climb up and draw there whenever he wants. She does have to keep a close eye on him, though, as he likes to draw on a wall now and then. You are so creative especially fitting to the holiday & age of childcare kids! Great Valentine gift project ~ as a mother & grandmother I would love to receive! Jo I love this art project. May try it with my great grandsons but I will be lucky. I only keep them one at a time. I have one 23 months old, one turning five first of March, and one turning six later this month. I don’t know how you do 5 between 15 and 24 months. You are a better woman than me and a whole lot younger. Don’t try to “correct” the over-aggresive pictures they are all beautiful. And that lady who said to leave them alone so the kids can see how they have improved from now until the next time they do this project will be show them that they are growing up is a very good idea. I think the one with the partially lifted letters is charming, and I hope you don’t alter it in any way. Honestly, I was always annoyed me when the daycare folks tried to correct my kid’s art projects. Apparently the ability to transition humanoids from having circles with lines sticking out for hands to something approximating a glove is a developmental milestone and it affected the center’s funding if the kids didn’t meet the milestones. It would have been cute to have the “O” replaced as their handprint, too! I meant “with” their handprint.